And the kitchen is as great as you'd expect. Valerie Safran and Marcie Turney own 10 bustling businesses in the Midtown Village neighborhood of Philadelphia (including five restaurants). So, when the couple bought their three-story loft, they knew exactly who to turn to for help designing their ideal home: Kate Rohrer. Interior designer and owner of the Philadelphia-based studio Rohe Creative, Kate Rohrer has spent more than a decade in the field, focusing on hospitality projects that include warm and vibrant restaurants, cafes, and bars. But in that time, she’s been tapped more than once to work on a restaurateur’s personal space. After Rohrer finished bringing the retro, New American restaurant to life, Safran and Turney asked the designer to work the same magic in their own new home. Rohrer’s goal was to keep the kitchen big and open, but warm and inviting. “That warmth really comes from the beautiful slabs of walnut on the custom cabinetry,” she says. The designer also used a thick slab of the walnut wood to create a shelf that bisects the big window, displaying a collection of cookbooks and greens. The gray and white tile backsplash adds visual interest and complements the marble countertops. “It was just a beautiful way to get a little bit of that geometric mid-century nod in a classic, timeless material, and it turned out beautifully,” says the designer. Rohrer found a creative way to make an unsightly television disappear. “One of my biggest pet peeves is having the TV be the focal point in a living room, which, unfortunately, you can’t avoid because you have to think about how someone uses the room,” she says. 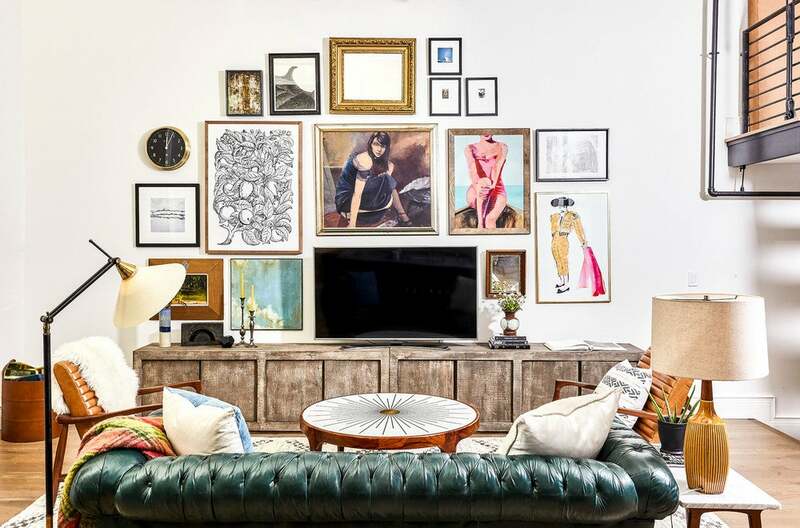 So, the designer transformed the flat screen into a beautiful gallery wall instead. “That wall, which was basically two stories, was screaming for something to accentuate it, so this was a way to get eclectic color and texture on that wall, against an otherwise white room,” she says. The designer added a little desk area to utilize an odd nook between the dining room and kitchen, using the same custom walnut cabinetry, navy blue color, and brass hardware to bridge the two rooms. Now, it’s the perfect spot for Safran and Turney to entertain friends and family.